I was hoping someone on this forum could help me, I bought this plant at the end of the summer from a local greenhouse, but no one explained to me how to take care of it and I can't seem to find anyone there to ID it for me. I was told when I bought it that it was a succulent, but I'm not sure if thats true or not. The tips of some of the lower leaves are starting to turn brown, I'm currently watering it around once a week. I'm not sure if any of this is correct. Any help would be greatly appreciated in IDing my plant and correct care instructions! Looks like Dracaena fragrans "Massangeana", sometimes called corn cane. Tap water will often cause browning tips with these. If you can't use rain water, let a jug of water stand overnight and see if that helps. 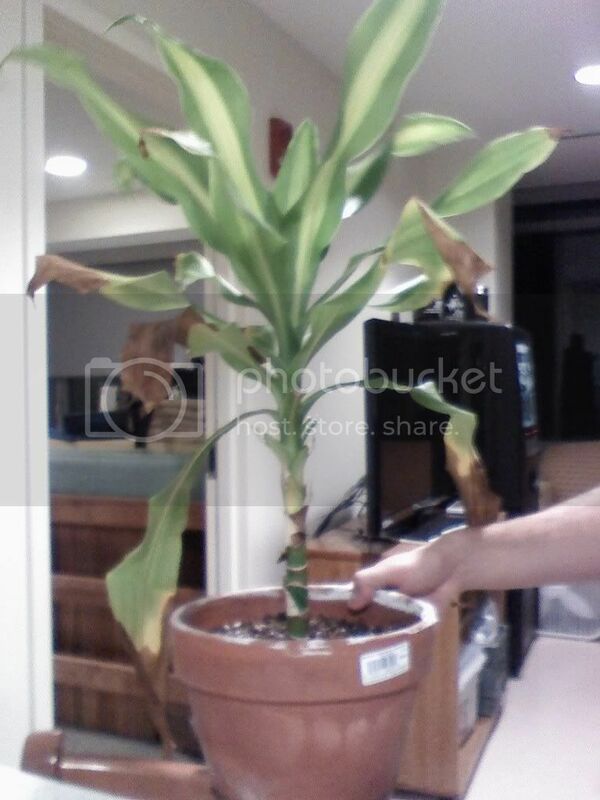 Now that I know how to properly care for my plant and how to water it, what type of sunlight to put it in, should I cut off the dying / browning leaves? Mine always grew in shifting shade outside (Florida) because I can't stand the scent of the flowers. They'll do okay indoors in offices, though. I'd suggest bright light, not direct sunlight. When I have minor leaf damage like this, I cut off the brown bits, just a hair of brown edge remaining. If you cut into the green, you'll probably still get a tiny edge of brown in a few days, so that's just saving millimeters. Sometimes on leaves of this shape, you can trim the ends in a V shape to approximate the natural tips, which will look better on the leaves with the most to lose. I've also just cut them on a diagonal when I've had a lot of work to do on a rescued plant. Is my raspberry plant dying?